Do you have a gift for learning languages? Are you interested in using and speaking those languages with native speakers? If so, The Bachelor of Arts in World Languages and Cultures (B. A.) may be just what you are looking for. You’ll get an in-depth study of the Spanish language and its speakers, a working knowledge of French, some grounding in the broader study of culture, and significant experience in interacting with native speakers. This breadth of coverage makes our program unique among the language programs offered at private colleges in North Georgia and elsewhere. Graduates of the program will be prepared for further language study in graduate school or any profession requiring the practical ability to speak second and third languages. In a multilingual world and nation, the opportunities for people with such talents are rich and various. 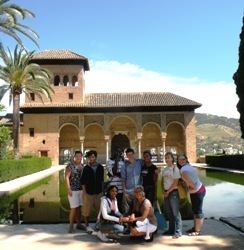 Students gather in the Plaza de la Catedral in Cadiz, Spain. 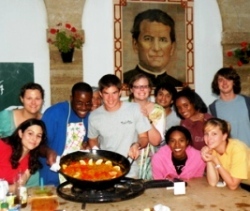 A paella party is part of the learning experience!